This illustration shows the father on his journey as the focal point. 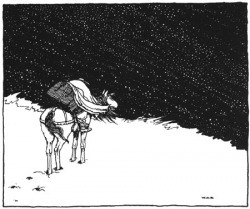 The author chose to do this in black and white to emphasize that the father and land are white showing good and what's familiar, where as what's ahead is black depicting the emptiness and scariness of what could lie ahead which evidently is the beast. The fact that it's snowing shows how he cant see very well. 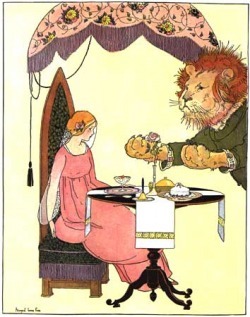 This illustration shows beauty and the Beast dining which is a very crucial part of the tale. 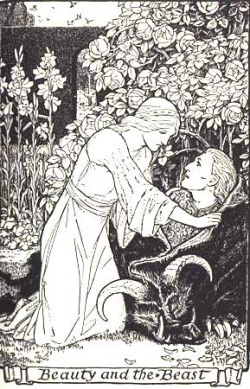 The image shows Beast as trying to impress Beauty by giving her a meal and a rose. Beauty is looking at the rose which shows that her eye is drawn to beautiful things rather then the ugly things like the Beast. There is also an expression of pain in Beauty's face knowing that the rose the Beast is showing her is the reason she is in the presence of this beast. She is the one that made her father pick the rose and the rose is the reason behind everything. Beauty however learns in the end that this rose has brought her to a kind soul and the love of her life. This image focuses on the male as a prince rather than a beast. The princess all in white is the focal point of the image while the prince's body is darker and as you move further up his body to his head the image lightens. Metaphorically speaking he is transforming from the beast to the prince(beauty). The head of the beast is laying on the ground, portraying the death of the beast that the prince once was. Also in the image he is shedding the beast and on the ground with the head of the beast is the bare ground. Near the head of the princess there are roses showing that as the prince sheds the beast to the ground things are looking brighter. This illustration is showing Beauty and the Beast dancing. The closeness from the dancing and how they are making eye contact shows that they are in love and Belle is not scared of the Beast. The eye contact between Beauty and the Beast also shows that when Beauty looks into the eyes of the beast she does not see a ferocious creature, she sees the heart and soul of a human being. Their clothes depict that they are trying to impress each other as well as the wealth of the beast. The clothes are showing the upper class status that Belle has inherited from the beast. 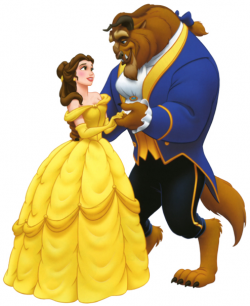 In this picture, Disney really focuses on the fact that the Beast is a creature and although he is not beautiful and much more large than Belle is she is still able to fall i love with him. His having human clothes on in some ways brings them together and makes them similar species, despite their very different physical appearance.